The elucidation of the genetic basis for hereditary recurrent fever syndromes validated the role of innate immune dysregulation in diseases formerly viewed as autoimmune. Recognizing the non-autoimmune nature of tumor necrosis factor receptor-associated periodic syndrome (TRAPS), one such syndrome, and the lack of evidence for autoantibodies or B- or T-cell involvement in the context of the emergent genetics, led to the proposal of the term autoinflammation in 1999. While formally coining a new term for this type of inflammation against self, the definition was essentially stating what inflammation was not, rather than what it was. Based on the lack of an association with humoral or cellular mediated immunity and the propensity for recurrent seemingly unprovoked attacks of inflammation, fevers, elevation of inflammatory markers, without high-titer autoantibodies or antigen-specific T lymphocytes, the new designation of autoinflammatory disorders also included some conditions that would have previously been considered autoimmune, e.g. Behçet disease (BD). BD is a prime example of the two-tiered classification of inflammation against self since BD has a strong population level human leukocyte antigen (HLA)-B51 association. Given the classically defined role of major histocompatibility complex (MHC)-I molecules in peptide presentation to T cells, this incriminates adaptive immunity in BD immunopathology, which was supported by clinical therapeutics, where immunosuppressant agents like azathioprine had a proven role in disease management. 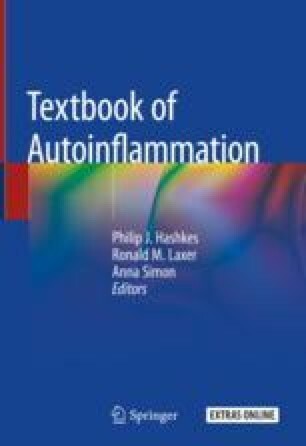 The purpose of this chapter is to summarize the overlap and differences between autoinflammatory and autoimmune disorders.